Folks from up and down the East Coast gathered at Cherry Grove Farm in Lawrenceville last night for a feast put on by Jim Denevan’s Outstanding in the Field prepared by Scott Anderson of elements restaurant. After passed hors d’oeuvres and a farm tour (watch out for those cow patties! 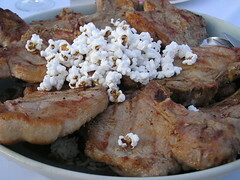 ), everyone sat down at a loooong table to enjoy green bean and beet salad, 48-hour brisket with cherry tomatoes and french fried onions, pork chops with gumbo, and poached peaches with farm brie and walnut honey. 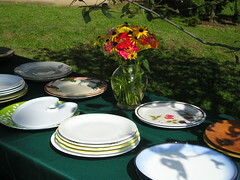 Attendees are asked to bring a plate, and are encouraged to swap plates for the dinner. You get your own plate back at the end (washed!). It’s a sharing thing. 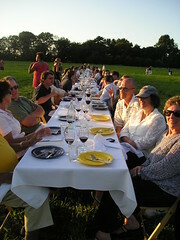 The whole affair felt very mellow, but was actually carefully orchestrated to that end, to encourage appreciation of the spontaneous and ephemeral nature (think Brigadoon) of dinner at an elegantly set table in a big field. 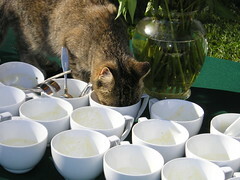 There were lots of farm cats, and this one decided to help wash the cups from a soup served with the appetizers. 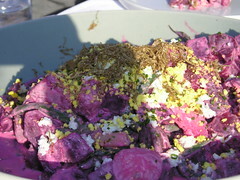 Gorgeous beet and green bean salad with sieved egg and (I think) anchovy dressing. Service was family style in wonderful Heath Ceramics bowls. There were over 100 of us at one long table. In between courses, folks wandered around, visiting the loo (a bit of a hike! 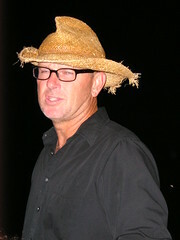 ), and talking to friend and strangers alike. 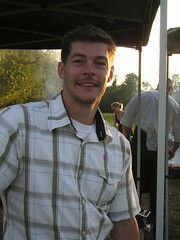 Elements chef Scott Anderson kept a low profile (shy guy! ), hard at work during dinner, but the minute he ventured near the table, everyone broke into applause and cheers. Through it all, OITF founder Jim Denevan calmly presided, kept very busy chatting with guests. He does about 60 of these a year now, traveling around in an old bus that breaks down regularly. Jim, thank you for such a marvelous evening, and ditto for Lisa, Leah, Katie, and all the other OITF staffers who work so hard and are so hospitable! Hope to see you in NJ next year! Faith, you write so energetically and convincingly of these events, both before and after. We are blessed to have such an enthusiast, so determined to share the wealth (gastronomically speaking) of our unique, yet underappreciated state!